On my second time in Paris this July, I was crossing Pont Neuf while suddenly I remember Audrey Hepburn. I have seen one of many Audrey Hepburn movies and I remember a particular line she said when asked by Bill Holden in “Paris When It Sizzles” about why did she come to Paris. She simply said in that big magical eyes of her, “I came to Paris to live”. Perfectly said. For I feel more alive in Paris. I had one Parisian day. I woke up in a compact hotel room, hardly a space for bathroom. I rode in Metro. With Le Figaro-reading-workers. With crumpled, unbathed student. I had croissant and café au lait in Chez-something. The only food I can spell correctly. I walked through a remnant wall and entered history of civilization, Louvre. I encountered Winged Victory, placed in the top of staircase, ready to fly. I met Venus de Milo, whose unarmed yet bewitched many hearts. I saw Monalisa, overrated mystery still smiling ruefully. I was a small fish, swimming in a bowl of universe. I went out, afraid it would became too much, wreck the magic. I crossed Pont du Carrousel, left my enlightment pyramid behind. 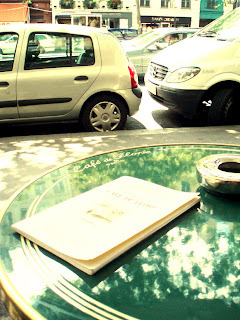 I watched sleepy old man sitting, watching his petit bookshop of vintage delight along Seine. I peeked at couple stealing French kisses on Pont Neuf, bitten by romance. I heard my stomach protesting in unison, of thirst and hunger. Even in Paris. I kept stopping in front of shop windows selling china and exotic objects of art. I sat down on red and green rattan chair, placed my elbow on green glossy table. I ordered Croquet de Monsieur and my second café au lait, and waiting. I captured people walking by, in hurry, in all shapes and colors imaginable, then waiting. Still. I savored cheese melted tenderly, mixed with black sweetness of cafein, in my mouth. I left Café de Flore in hurry, after asked Jacquez The Waiter took my picture while smiling knowingly (Ah, touriste!). I strutted through Musee d’Orsay, like Catherine Deneuve with Paris Museum Pass. I gasped, stunned, tempted and fell for Monet, Manet, Renoir, Degas, Lautrec and Gauguin. All over again. I was swimming in impression of colors for eternity, etched forever in brain. I was furiously back to the Rue on six o’clock. I used my angry tired feet once again, chasing Hemingway shadow from many years ago. I found him in Shakespeare and Co. I felt myself lost, an Alice in her Wonderland of Books. I touched dusty bonded books, perhaps once read by Kerouac. I bought some books, wishing I was buying history. I bought a thick shwarma and found a bench near the Seine. I scorned tourists in Batobus, hysterically blitzing whatever they thought they see. I washed down the last piece with red wine, tipsy with Paris. I walked back to my cot.